Mother of Divine Grace School is a private school accredited by the Western Association of Schools and Colleges (ACS WASC). 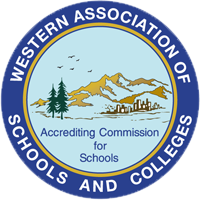 WASC has determined that Mother of Divine Grace School's course of studies, educational goals, academic records, and accounting and business practices meet the accepted standards for a private school. ACS WASC advances and validates quality ongoing school improvement by supporting its private and public elementary, secondary, and postsecondary member institutions to engage in a rigorous and relevant self-evalua on and peer review process that focuses on student learning. Through ACS WASC's evaluation of institutions, ACS WASC accreditation assures the educational community, the general public, and other organizations and agencies that an institution has clearly defined objectives appropriate to education; has established conditions under which their achievement can reasonably be expected; appears in fact to be accomplishing them substantially; is so organized, staffed, and supported that it can be expected to continue to do so; and demonstrates that it meets ACS WASC's criteria and accreditation standards. ACS WASC encourages and supports institutional development and improvement through an institutional self-evaluation using the accreditation criteria and policies, as well as mid-cycle, follow-up, and special reports, and periodic evaluation of institutional quality by qualified peer professionals.